It always seemed as though Highway 7 was busy, cars and trucks rushing along, especially on the weekends, and even more so during the summer months. According to Dad, it wasn’t just the local people travelling between Perth and Sharbot Lake, but all the tourists that rambled along the Trans-Canada Highway, doing a little sight-seeing, and exploring the countryside. Whatever the reason, Highway 7 was busy as usual that Sunday afternoon so long ago, as we made our way to Silver Lake. Although it was just a twenty minute drive from the old house, the ride seemed to take forever, our legs sticking to the hot vinyl seats in the back of the Buick, long before the days of air conditioning. It wasn’t until I saw the signs for the village of Maberly that I breathed a sigh of relief, knowing we’d be there in just a few more minutes. Dad flicked on his signal, I felt the car slow down, and we turned, and drove up the hill to the entry booth at Silver Lake Provincial Park. The park worker came over to the window, Dad showed his seasons pass, and he waved us through. Dad found a spot close to the picnic area, and we drove in and parked the car. That was the easy part. The tricky part was finding just the right picnic table. Dad liked a table to be in the shade. Mother preferred a place with a little sun. Dad said he needed to be out of the wind so he could light his little green Coleman stove. Mother liked a breeze to keep the bugs away. So the hunt for the best table usually took a little longer, sometimes a lot longer, than it should have. After all, we just wanted to cool off in the water, and that beautiful lake stretching out ahead of us, sparkling in the sun, was all we could think about. Who cared where we ate supper? The hunt for the perfect table continued. Should we use one of the tables under the shelter in case it rained, or maybe one of the ones farther up the hill, off by itself? There was a good table close to the main beach, but there were a bunch of rowdy people sitting at the table right next to it, and Mother wondered aloud if that’s why no one else was using it. They finally spotted a table halfway up the hill, toward the lower beach, and sent one of us up the ridge to ‘save’ it. Dad opened the trunk, and we each grabbed something, and made our way up to the table. The table cloth, Coleman stove, cooler, plastic cups and plates, paper napkins, transistor radio, saucepans, and cooking utensils, were all brought to the site. We hauled the picnic gear up the slope, and set it all down on the seats, while Mother spread out the red plastic table cloth. It wasn’t until we placed the big cooler on the table that we noticed that the table rocked back and forth. Good grief! I hoped to myself that we wouldn’t have to pick another table! Dad got the boys to lift one end, while he lifted the other, and re-positioned it until it was stable. What a relief! While Mother took everything out of the cooler, Dad turned on his portable radio, extended the antenna, and went about setting up his little green metal stove. I grabbed a towel from the top of the cooler, and headed down to the beach, finally free to jump in the lake and get cooled off. As I got closer to the beach, the noise and laughter from all of the kids grew louder, and I could see people jumping off of rubber rafts, and throwing beach balls around, and some little kids were filling up sand pails, and making sand castles along the shore. I stepped cautiously into the shallow water along the sandy shore and it felt cool. Because I was right in the center of the main beach, I got splashed again and again by the other kids running in and out and jumping nearby. I walked out slowly, up to my knees, and then finally plunged in all the way, and the water didn’t seem cool anymore; it was just perfect. There was a kid close by with a diving mask on, and another kid with a fancy inflatable raft, and he was gliding along the surface using his hands to propel himself. I wondered what it would be like to have these expensive gadgets to play with in the water. We had an old beach ball that kept shrinking because it leaked air, and that was about it. Oh well, it was fun to splash around and cool off just the same. I put my face in the water and opened my eyes. The bottom was sandy, with some smooth pebbles, and a couple of snail shells. There were some tiny minnows darting around, and lots of arms and legs of kids playing nearby. I pulled my face back out of the water, took a deep breath, and propelled myself down to the bottom, pushing the water back with my arms, moving farther from the beach. When I felt myself running out of air I resurfaced, rubbed my eyes, and looked back at the beach. There were lots of parents relaxing in lawn chairs, watching their kids swim. Little kids were playing close to the shore, and bigger kids were splashing around, squealing, laughing, and the bright July sun gleamed and glistened on the surface of the water. I played in the water for hours, bobbing at the surface, swimming along the bottom, jumping into the gentle waves, and floating on my back and kicking my feet, then gliding backwards, staring up at the bright sun and the blue sky. I watched as new kids came into the water, and other kids left the beach, heading over to the playground, past the parking lot. By the time Mother came down to the beach to call me for supper I’d had plenty of time to swim, my fingertips were wrinkly, and I was ready to come out of the water. As we walked up the path to the picnic table I began to smell the gas from the Coleman stove, and the savoury scent of the hot dogs, and I began to realize how hungry I was. The fresh corn was already boiled and stacked on a tray. There was a bowl of baked beans, a homemade potato salad, some deviled eggs, homemade rolls, pickles, and a jellied salad. Everything tasted good, partly because I was hungry from swimming, but mostly because we were outside. Things always seemed to taste better outdoors in the fresh air for some reason. Dessert was Mother’s lemon squares. There was also a cookie tin of brownies, and some butter tarts. No one went hungry at our picnics; that was for sure. After we’d finished and cleaned up, we decided to walk across the road to Barbary’s store. The traffic was very busy on Highway 7, so we had to wait quite a while until both lanes were clear, and then walked quickly across. The store was huge, and they had everything – groceries, camping gear, water toys, even life jackets; anything that you might need if you were camping, or visiting the lake. They had lots of souvenirs, postcards, and knick-knacks for tourists. Dad asked me if I’d like a chocolate bar, but I’d spotted something even better. The store carried Partridge Family bubblegum cards, and I was collecting them, so I asked if I could have those instead. Dad agreed and bought me those, and bought chocolate bars for everyone else, and he also picked up a fly swatter that he’d spotted hanging up by the cash register. We left the store, and once again waited a while until the road was clear, and walked quickly across. We strolled up the hill to the park entrance, through the gates, past the washrooms and change rooms, down the hill through the parking lot, and back up to the picnic table. We each picked up something, and headed down the hill to the car, and packed everything back into the trunk. Once the car was packed, we went for a walk along the smaller, quieter beach on the other side of the picnic area. It was more peaceful at that beach, and there were only one or two kids with their parents down near the water. As we walked along I picked up some smooth stones, and a couple of snail shells, to bring back home. The early evening sun was lower in the sky, but still bright, and it bounced and played off of the water, and shimmered through the trees along the shore. The air was fresh and clean, and carried with it the soft scents of the lake and the nearby trees. Many Sunday afternoons were spent at Silver Lake. There were no splash pads, or giant water slides. We swam without water wings. Our only concern was how fast we could get into the lake to swim, and not how we looked in our bathing suits. The old car had no air conditioning, and our entertainment at supper consisted of a small transistor radio. If we wanted to call a friend we had to wait ‘til we got home and hope that none of the neighbours was using the party line. We filled our dinner plates time and again, stuffed ourselves with desserts, and never counted a single calorie. We didn’t send text messages; instead we talked to each other, and shared a few laughs. Although there have been many useful advances in technology since those days, I will always treasure our simple summer picnics. I yearn for the clear water, the beach-scented air, and quiet walks along the sandy shores. I miss the shrieks of genuine laughter, and carefree splashing in the warm waves. I dream of the distinctive smell of the Coleman stove, and the unmistakable flavours of the homemade comfort foods. Most of all, I long for the effortless, unguarded conversations that we shared between bites. Surely in today’s hectic, stressful world, constantly connected to the internet, we could all find some welcome relief in the peace, tranquility and simplicity of an old fashioned picnic at the lake. 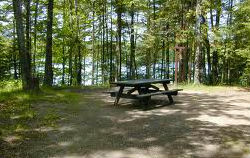 This entry was posted in Short Stories and tagged Arlene Stafford-Wilson, Lanark County Tourism, Maberly, Old Fashioned Picnics, Ontario Parks Silver Lake, Parkside Service Centre, Perth Ontario Tourism, Silver Lake, Silver Lake Provincial Park. Ahhh, those were the days, such a lovely beach, my favourite. Hello Dee – Thanks for sharing your memories of Silver Lake. It was a special to many of us and will always remain in our hearts. Thanks for stopping by!